Celebrate an unbirthday or any day with tea from this enchanting pot. One side shows the Mad Tea Party, the other shows the Red Queen's idea of croquet, played with live flamingos. Designed in England, porcelain pot holds 2 cups. 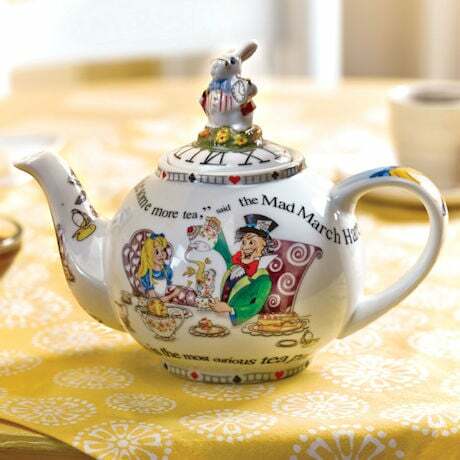 The handle on the lid is the White Rabbit, clutching his alarm clock and no doubt thinking "I'm late!" 7½" wide, 6" high. Dishwasher and microwave safe. Arrives gift boxed.